Authors: Charles E. Hansen et al. One of the most elementary components of star formation theory is the derivation of the Jean’s mass: a simple calculation that finds the mass of a molecular cloud able to collapse under its own gravity despite resistance from thermal pressure. This characteristic fragmentation mass scale varies inversely with the cloud’s density in an isothermal medium, and therefore decreases as the cloud collapses and becomes denser. Unimpeded, the Jean’s mass will dwindle to zero as the cloud collapses. Therefore, there must be additional relevant physics contributing to the ability of the collapsing molecular cloud to halt runaway gravitational collapse and form a star. Two suggestions for the pressure support mechanism are radiation feedback from the luminosity of forming protostars themselves and winds generated by accreting protostars. The authors perform four different simulations to explore the effects of these feedback mechanisms: one contains neither winds nor radiation, one contains radiation but no winds, one contains winds but no radiation, and one contains both winds and radiation. Figure 1: Column density over the entire simulation is shown, the color bar marking density in g/cm^2. Both columns exclude radiative feedback. The left column includes protostellar winds. White circles mark locations where stars have formed. This suite of simulations contributes to our understanding of what those additional pieces of physics are by comparing the simulated effects of two feedback mechanisms to observations of star forming regions. The simulations begin with a cold, dense, dusty molecular cloud to which supersonic turbulent initial conditions are introduced. The gas is then allowed to evolve according to the standard fluid and energy equations. The figure at right shows the barotropic models including protostellar wind (left) and excluding protostellar wind (right) at increasing times. The simulations are allowed to run for 315,000 years: the free-fall time for a typical cloud. The top panels show each system in its initial state, and subsequent rows show snapshots of the density in increments of .3 free-fall times. We see three high-density turbulent cores evolve with time and eventually become populated with stars, marked with the white circles. An essential feature of any star-formation theory or simulation is its ability to reproduce the empirical distribution of stellar masses called the initial mass function (IMF). The figure below shows the distribution of masses from all four simulations as a blue histogram. For comparison, the Chabrier IMF is over-plotted in green. The IMF predicted by two theories of protostellar accretion are over-plotted in dashed red and blue. Figure 2: The mass function from each simulation is shown by the blue histograms. The empirical Chabrier mass function is plotted in green, and the mass distributions predicted by two theories of protostellar accretion are showen in dashed red and blue. The simulations that include protostellar outflows reproduce the expected mass functions faithfully, while simulations that exclude outflows produce top-heavy mass functions. The authors conclude that winds are therefore an essential ingredient in low-mass star formation. 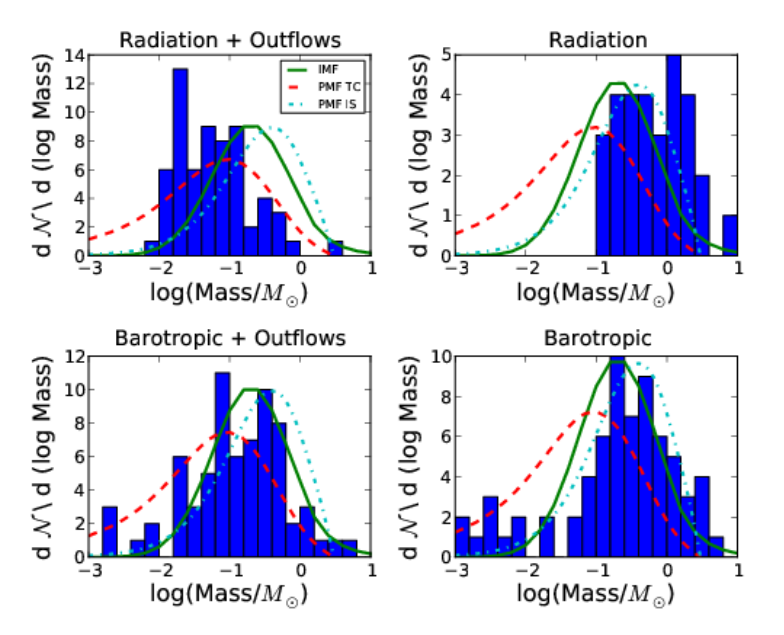 A Kolmogorov-Smirnov test revealed that it is likely the Barotropic+Outflows simulation and the Radiation+Outflows simulations are part of the same parent population, indicating that radiation feedback does not play an important role in the way low-mass stars fragment on scales resolvable in these simulations. Agreement between observed and simulated low-mass stellar luminosities provides further support for the wind driven models: the mean, median, and variance of the populations simulated by Radiation + Outflow driven models agree with observations of local star-forming regions. Finally, comparison of the spatial distribution of stars in the simulations to stars in nearby star-forming region Rho Ophiuchus show that the outflow-driven simulation can reproduce yet another aspect of low-mass star-forming regions. The agreement of the simulations with observed mass, luminosity, and spatial distributions lead the authors to conclude that protostellar outflow feedback is indeed an important mechanism for molecular cloud collapse and star formation.